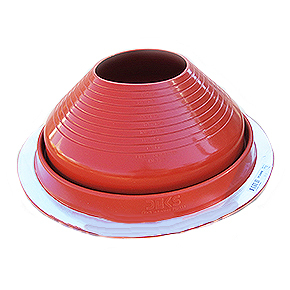 PRODUCT: #9 ROUND BASE RED SILICONE PIPE FLASHING. 25-1/4" DIAMETER BASE. OPEN TOP. FITS 10" to 18-3/4" O.D. PIPES. PRICE/EACH BOOT (5 boots/case, order full cases for discounts).